After a disappointing finish this past weekend in Nashville, the Vanderbilt Commodores (3-4 overall) hit the road for three straight games still in search of their first SEC win. If this team wants to become bowl eligible, they will have to finish the season 3-2 which means at least one win on the road. The opponent this week will be a 5-1 Kentucky team that is ranked 14th in the nation and having one of its best seasons in program history. At his press conference on Tuesday afternoon, head coach Derek Mason applauded the efforts of Kentucky this season. Mason has seen some good things from his team the last few weeks, but a lot of ugly things as well. 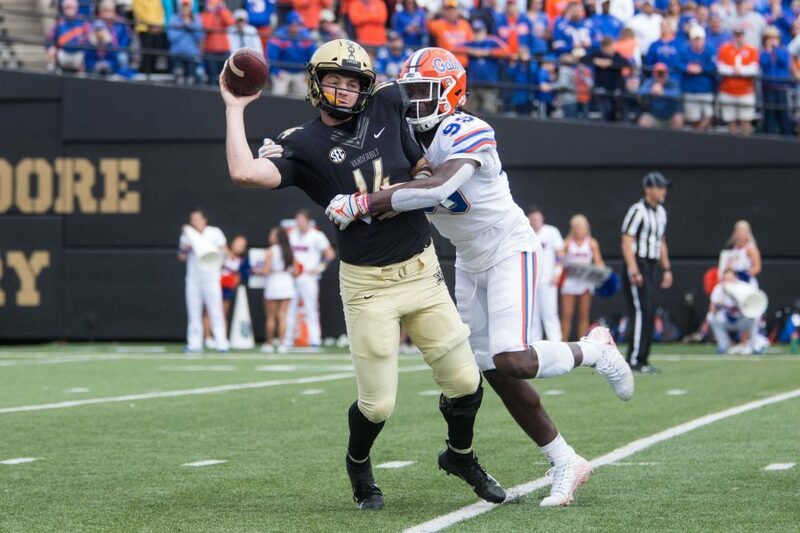 After a fantastic first half against Florida, quarterback Kyle Shurmur and the offense struggled to move the ball and put points up in the second half. The offensive struggles could possibly be attributed an injury to running back Ke’Shawn Vaughn and a number of key drops by receivers. “We got behind on a couple of early pass downs with a couple of drops that really stagnated a couple of those drives,” Mason said. With the competition that the Commodores face each week, the margin for error is already razor thin and fundamental errors can prove to be lethal. Mason voiced his frustrations over the drops. He also stressed the importance of getting the ball to his playmakers, and the Commodores have no bigger weapon than Junior reciever Kalija Lipscomb. Mason noted that after watching film, Lipscomb was clearly open. As one of the best receivers in the SEC, it is imperative for quarterback Kyle Shurmur to continue to look Lipscomb’s way. Lipscomb admitted that last week was frustrating but he continues to support his team. On the defensive side of the ball, defensive coordinator Jason Tarver will look for more consistency and the ability of his team to get off the field on third down. This continues to be an issue for the Commodore defense as against Florida, as they were forced to be on the field for 92 plays. If the Commodores want to stop Kentucky’s offense, the main focus will be the SEC’s leading running back junior Benny Snell. Snell has rushed for 700 yards and eight touchdowns already this season. Mason sees the Kentucky offense as a 65% running unit and will emphasize the importance of tackling as a group to stop Kentucky’s running game. So how close is this football team from an SEC win? Defensive end Dare Odeyingbo agrees with his coach that this team is close. The Commodores will have to play a complete game this weekend, which is not something we have seen them do arguably since the Notre Dame loss back in September. But the team’s spirits remain high and Mason is ready.